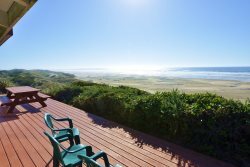 The Outlook at Heceta Beach is a fantastic 4 bedroom, 3 bath beach house right on the sand and surf that comfortably sleeps 10 people. With panoramic windows and a full deck across the length of the house, just walk out the sliding door to fabulous sights and sounds and miles of pristine beaches found nowhere else in the Great Northwest. The Outlook at Heceta Beach is one of the few vacation homes in Florence right on the beach. For those who like to venture out, step off the deck to a gentle sand trail winding down to the beach. The one-of-a-kind coastline offers miles and miles of pristine beaches as far as the eye can see. Enjoy your morning stroll or perhaps a jog that others can only dream about. For those who love the sand, bring your quads and ATVs to the sand dunes just a couple minutes south of town. Visit Old Town Florence and explore the wonderful bistros, restaurants, galleries, and shops along Bay Street. Just a few minutes north along the coast and you’ll find world famous and most photographed Heceta Head Lighthouse as well as the Sea Lion Caves! For the avid fisherman, test your skills on one of the 27 lakes in the Florence area sporting some of the best trophy bass. Still trying to land that trophy Steelhead, well don’t forget salmon season on the Siuslaw River. The Outlook at Heceta Beach has all of the fun under the sun when it comes to that perfect vacation getaway!